New Apple touch patents are published on Jul. 3, 2008. W. Westerman (Apple), "Gesture learning," US20080163130, Jul. 3, 2008. Abstract: Systems and methods that incorporate various techniques for teaching gestures to a user of a multi-touch sensitive device are disclosed herein. Such techniques can include presenting visible feedback of gestures, such as animated motion trails and/or hand motions, along with affirmative feedback for correctly performed gestures and negative feedback for incorrectly performed gestures. Such techniques can be expanded to provide training exercises that present tasks requiring a particular gesture or sequence of gestures to be performed. These training exercises can take the form of games or other engaging activities to encourage use. C. H. Krah et al. (Apple), "Multi-touch auto scanning," US20080162996, Jul. 3, 2008. Abstract: A system and method for autonomously scanning a sensor panel device, such as a multi-touch panel, is disclosed. In one embodiment, the system and method disables a sensor panel processor after a first predetermined amount of time has elapsed without the sensor panel device sensing any events. One or more system clocks can also be disabled to conserve power. While the processor and one or more system clocks are disabled, the sensor panel device can periodically autonomously scan the sensor panel for touch activity. Accordingly, if one or more results from the autonomous scans exceed a threshold, the sensor panel device re-enables the processor and one or more clocks to actively scan the sensor panel. If the threshold is not exceeded, then the sensor panel device continues to periodically autonomously scan the sensor panel without intervention from the processor. Furthermore, the sensor panel device can periodically perform calibration functions to account for any drift that may be present in the system. J. G. Elias (Apple), "Projection scan multi-touch sensor array," US20080158198, Jul. 3, 2008. Abstract: A touch sensor panel can be constructed on a single surface of a substrate. The panel can be formed as a plurality of distributed RC lines arranged in an array of rows and columns. Each distributed RC line can include alternating connected transistors and metal pads formed on a single surface of the substrate. During operation, the rows and columns are enabled at different times, and the pulse travel times for each row and column in both directions are measured. Equalized travel times are then computed as the sum of the pulse travel times in both directions, and indicate which rows and columns have a finger touching it. The un-equalized pulse travel time data can then be used to determine the relative positions of the fingers within the rows and columns and un-ambiguously determine the positions of all the finger contacts. W. Westerman (Apple), "Multi-touch input discrimination," US20080158185, Jul. 3, 2008. Abstract: Techniques for identifying and discriminating between different types of contacts to a multi-touch touch-screen device are described. Illustrative contact types include fingertips, thumbs, palms and cheeks. By way of example, thumb contacts may be distinguished from fingertip contacts using a patch eccentricity parameter. In addition, by non-linearly deemphasizing pixels in a touch-surface image, a reliable means of distinguishing between large objects (e.g., palms) from smaller objects (e.g., fingertips, thumbs and a stylus) is described. B. R. Land et al. (Apple), "Error compensation for multi-touch surfaces," US20080158184, Jul. 3, 2008. Abstract: Normalization of the built-in DC offset error in each analog channel is disclosed to reduce image distortion in multi-event (multi-touch or multi-hover) sensor panels. By eliminating the component-dependent offset error from each analog channel, each analog channel will generate approximately the same output value for a given dynamic input signal. Normalization can include “phantom row” compensation, which involves measuring the static output value of each analog channel when no stimulus is applied to any row of a multi-event sensor panel, and subtracting this value out of any subsequent output value generated by the analog channel. Normalization can also include DAC offset compensation, which involves setting the offset compensation voltage of each analog channel to some fraction of its normal value, measuring the output of the analog channel over temperature, determining a temperature coefficient, and adjusting any subsequent output value generated by the analog channel to account for this drift. S. P. Hotelling et al. (Apple), "Double-sided touch-sensitive panel with shield and drive combined layer," US20080158183, Jul. 3, 2008. Abstract: A multi-touch capacitive touch sensor panel can be created using a substrate with column and row traces formed on either side of the substrate. To shield the column (sense) traces from the effects of capacitive coupling from a modulated Vcom layer in an adjacent liquid crystal display (LCD) or any source of capacitive coupling, the row traces can be widened to shield the column traces, and the row traces can be placed closer to the LCD. In particular, the rows can be widened so that there is spacing of about 30 microns between adjacent row traces. In this manner, the row traces can serve the dual functions of driving the touch sensor panel, and also the function of shielding the more sensitive column (sense) traces from the effects of capacitive coupling. M. A. Hamblin et al. (Apple), "Double sided touch sensitive panel and flex circuit bonding," US20080158181, Jul. 3, 2008. Abstract: A multi-touch sensor panel can be created using a substrate with column and row traces formed on either side. Metal traces running along the border of the substrate can be used to bring the row traces to the same edge as the column traces. A single flex circuit can be fabricated to connect to the rows and columns on directly opposing sides. Flex printed circuits can be bonded to directly opposing attachment areas of a substrate by cooling one side of the substrate while bonding the other. In addition, “coverlay” material extending over right-angled traces on the flex circuit ensure that those traces do not get shorted should conductive bonding material get squeezed out during bonding. Furthermore, a spacer is placed at the distal end of the flex circuit to apply even bonding pressure over the entire flex circuit attachment area during bonding. B. R. Land et al. (Apple), "Full scale calibration measurement for mujlti-touch surfaces," US20080158176, Jul. 3, 2008. Abstract: Normalization of regions of a sensor panel capable of detecting multi-touch events, or a sensor panel capable of detecting multi-hover events, is disclosed to enable each sensor in the sensor panel to trigger a virtual button in a similar manner, given the same amount of touch or hover. 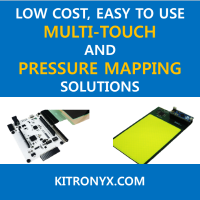 Each sensor produces an output value proportional to the level or amount of touch or hover. However, due to processing, manufacturing and physical design differences, the sensor output values can vary from region to region or panel to panel for a given amount of touch or hover. To normalize the sensor output values across regions, gain and offset information can be obtained in advance, stored in nonvolatile memory, and later used to normalize the sensor output values so that all regions in the sensor panel can trigger virtual buttons similarly, providing a uniform “response function” at any location on the sensor panel. M. A. Hamblin et al. (Apple), "Multi-touch surface stackup arrangement," US20080158173, Jul. 3, 2008. Abstract: A multi-layer cover for an electronic device having one or more of a sensor panel, a proximity sensor, an ambient light sensor, and a display device can include an outer hardcoat, a structural layer, an IR transmissive ink layer, a mask layer, and a backside hardcoat. The backside hardcoat can reduce cover warpage, enable full surface lamination of the cover to the sensor panel, prevent bubbles from forming in transparent windows in the cover, enable a wider range of functional inks to be applied in various layering orders to allow certain types of light to pass through while blocking others, and hide the sensors to provide a seamless, uncluttered visual appearance. S. P. Hotelling et al. (Apple), "Proximity and multi-touch sensor detection and demodulation," US20080158172, Jul. 3, 2008. Abstract: The use of one or more proximity sensors in combination with one or more touch sensors in a multi-touch panel to detect the presence of a finger, body part or other object and control or trigger one or more functions in accordance with an “image” of touch provided by the sensor outputs is disclosed. In some embodiments, one or more infrared (IR) proximity sensors can be driven with a specific stimulation frequency and emit IR light from one or more areas, which can in some embodiments correspond to one or more multi-touch sensor “pixel” locations. The reflected IR signal, if any, can be demodulated using synchronous demodulation. In some embodiments, both physical interfaces (touch and proximity sensors) can be connected to analog channels in the same electrical core. S. E. O'Connor et al. (Apple), "Noise detection in multi-touch sensors," US20080158169, Jul. 3, 2008. Abstract: Multi-touch touch-sensing devices and methods are described herein. The touch sensing devices can include multiple sense points, each of which can be stimulated with a plurality of periodic waveforms having different frequencies to measure a touch value at the sense point. Noise at one or more of the frequencies can interfere with this measurement. Therefore, various noise detection (and rejection) techniques are described. The noise detection techniques include two-clean-frequency noise detection, one-clean-frequency noise rejection, and combined two-clean-frequency/one-clean-frequency noise detection. Each of the noise detection techniques can include statistical analyses of the sample values obtained. The touch sensing methods and devices can be incorporated into interfaces for a variety of electronic devices such as a desktop, tablet, notebook, and handheld computers, personal digital assistants, media players, and mobile telephones. W. Westerman et al. (Apple), "Far field input identification," US20080158168, Jul. 3, 2008. Abstract: Techniques for identifying an object in close proximity to, but not in contact with, a multi-touch touch-screen device are described. By way of example, a cheek or ear hovering a short distance from the touch-surface (e.g., approximately 1 to 3 centimeters) may be identified and distinguished from physical contacts to the surface. S. P. Hotelling et al. (Apple), "Simultaneous sensing arrangement," US20080158167, Jul. 3, 2008. Abstract: Multi-touch touch-sensing devices and methods are described herein. The touch sensing devices can include multiple sense points, each located at a crossing of a drive line and a sense line. In some embodiments, multiple drive lines may be simultaneously or nearly simultaneously stimulated with drive signals having unique characteristics, such as phase or frequency. A sense signal can occur on each sense line that can be related to the drive signals by an amount of touch present at sense points corresponding to the stimulated drive lines and the sense line. By using processing techniques based on the unique drive signals, an amount of touch corresponding to each sense point can be extracted from the sense signal. The touch sensing methods and devices can be incorporated into interfaces for a variety of electronic devices such as a desktop, tablet, notebook, and handheld computers, personal digital assistants, media players, and mobile telephones. W. Westerman et al (Apple), "Peripheral pixel noise reduction," US20080158147, Jul. 3, 2008. Abstract: Techniques for identifying and discriminating between different input patterns to a multi-touch touch-screen device are described. By way of example, large objects hovering a short distance from the touch-surface (e.g., a cheek, thigh or chest) may be identified and distinguished from physical contacts to the surface. In addition, rough contacts due to, for example, ears and earlobes, may be similarly identified and distinguished from contacts due to fingers, thumbs, palms and finger clasps. In one implementation, a unique technique to reduce the noise in segmented image peripheral pixels. W. Westerman (Apple), "Irregular input identification," US20080158146, Jul. 3, 2008. Abstract: Techniques for identifying irregular objects in contact with, or in close proximity to, a touch-surface are described. An irregularity measure is determined based on the regions intrinsic characteristics (e.g., energy content) rather than on the shape (or pattern) of the pixels within the region. W. Westerman (Apple), "Multi-touch input discrimination," US20080158145, Jul. 3, 2008. Abstract: Techniques for identifying and discriminating between different input patterns to a multi-touch touch-screen device are described. By way of example, large objects hovering a short distance from the touch-surface (e.g., a cheek, thigh or chest) may be identified and distinguished from physical contacts to the surface. In addition, rough contacts due to, for example, ears and earlobes, may be similarly identified and distinguished from contacts due to fingers, thumbs, palms and finger clasps.